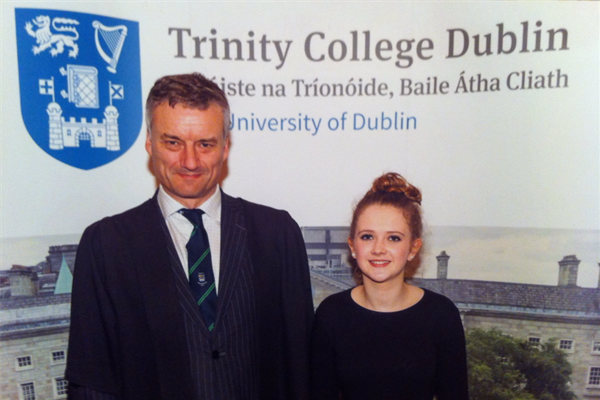 Pictured above is Sara Finnerty, Leaving Certificate student 2015, winner of an Entrance Scholarship to Trinity College, Dublin, with Dr Patrick Prendergast, Provost of Trinity College. The Business Department has a staff of four teachers who have extensive expertise and experience in teaching and working in the private sector. 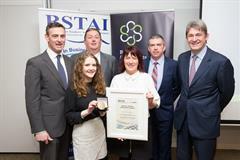 Business Studies is taught in the Junior Cycle. Economics, Accounting and Business are taught at Senior level. Over the years staff members have been involved in curriculum development, teaching workshops, and in-career development which have contributed greatly to the collective wisdom of the department. Along with this teachers have a keen appreciation of the dynamics of an ever changing economic climate. The Head of Department operates on a rotation basis every two years which gives all staff members an overall insight into subject development, as recommended by the Department of Education. The Business team manage the department, which strives to create the most effective learning environment for students. This is achieved by combining academic rigour, effective pedagogies and learning strategies with the latest information and communications technology (ICT). Continuous professional development has always played an important role in the business department keeping up-to-date with the latest developments in education across the three disciplines. 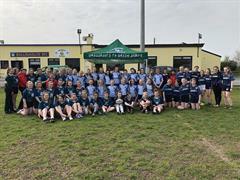 Extensive preparation has taken place in the rolling out of the new Junior Cycle Programme which is being assessed for the first time this year. The department aims to develop 21st century skills such as problem solving, collaboration and innovation while being conscious of the personal development of each of our students. The topical nature of the business subjects ensures that the business department keeps up to date with the latest developments in the world of economics and business. Over the years, the Business Department has developed a number of initiatives to promote a greater understanding and appreciation of the business subjects and their role in modern society. These have included Transition Year projects such as mini company modules, stock market simulation and employment rights Webquests. 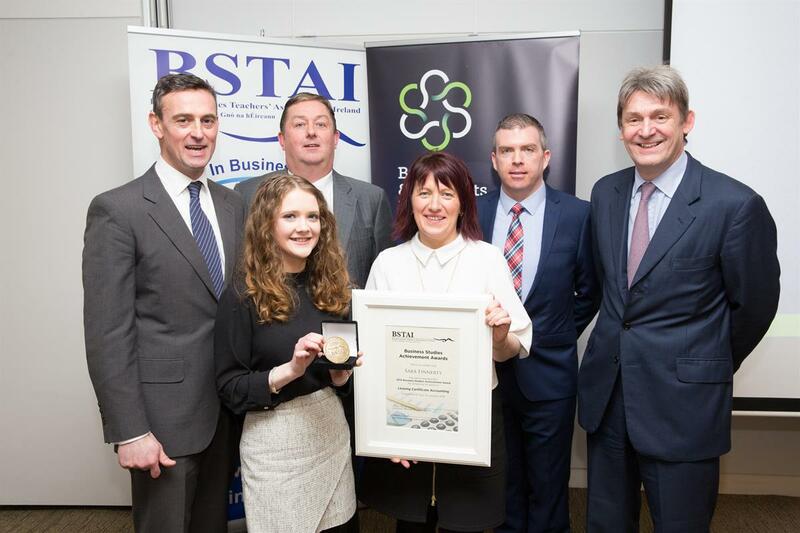 Our Junior Cycle students have participated in the Young Economist of the Year competitions. In 2016, Senior Cycle students won the Euroscola competition organised by the European Parliament. This year we are delighted to have been designated Senior Ambassador for the European Parliaments School Programme. All these activities are enthusiastically supported by the School. In addition, Business Studies students are regularly awarded prizes for their achievements at Junior and Senior Cycle examinations. Macroeconomics then considers how governments handle the economy as a whole, and how they select policies which meet their goals, such as stable economic growth (avoiding recessions), minimising the national debt, and encouraging employment. How the government handles issues such as fiscal policy (how much money flows in the economy), international trade, and banking all have implications for economics stability and growth. Anyone considering a future career in any area of business, journalism or finance should consider studying Economics. This subject teaches the skills and knowledge needed to understand how business works. There are 7 core units covering the following topics: Introduction to people in business; Enterprise; Managing 1 & 2; Business in action; Domestic Environment and International Environment. There is a common syllabus covering Higher and Ordinary level, which will fulfil the aims and objectives of the course. A flexibility of design that caters for present day Irish business education and yet is capable of adaptation to future developments in a structured and efficient way. It assists students to develop their education for adult and working life including the creation of positive attitudes towards self-employment. Section 3 – Management Accounting. Questions must be answered from all sections of the exam paper. Accounting is a dynamic and challenging career that can take you to the height of your abilities. Accountancy is a recognised qualification that can be used abroad. Accountants can work in a wide variety of finance roles for many types of organisations, including manufacturing companies, local and central government, the health service, banks and insurance companies, actuarial studies, marketing and private accountancy firms. It would also be an important subject choice for those thinking of starting their own business. Business studies encourages students to develop an appreciation of how their lives are shaped by economic and social factors. They are enabled to make informed decisions, to better manage their personal financial resources and to be adaptable, creative, and enterprising. Business studies also improves their knowledge and understanding of good business practice and of business as a productive activity. Entrepreneurship enhances the quality of our collective and individual lives, often changing the way we work, communicate and live. Business studies provides an awareness, insight and positive attitude to entrepreneurship , demonstrating how it can improve our goods, services and institutions. Business studies encourages students to develop skills for learning, skills for work and skills for life. It supports the development of analytical and critical thinking skills, encouraging students to be problem solvers. It reinforces the development of students’ numeracy, literacy and digital technology skills by providing a real-life context for their application. From 2007 to 2010, St. Brigid’s participated in the Coca Cola Blastbeat mini-music Company competition for schools in Ireland. We won prizes in 2008 for Marketing and Mentoring. Check out the professionalism of the presentation our students put forward to win the prize! Always keen to use a range of pedagogies in helping our students to learn, webquests which offer directed learning opportunities to students to research on line were used to investigate the exploitation of child Labour in a number of countries. In 2009, TY students took a module “Working around the World” to highlight the working conditions of people all over the world. This involved research on the conditions people all over the world work in to produce products we use every day. This module was a collaborative project between the Geography and Business Departments. Check out their presentation on Child Labour in the Democratic Republic of the Congo!